I'm starting to get twitchy wanting to sew, which is only ever a good thing. My custom regency stays pattern arrived months early (not questioning it! ), although I've taken it to a copy shop to get a back up in case I lose any pieces. I know myself only too well. I'll be starting the mock up this weekend. The hobby I took up in the Christmas holidays has been a little addictive. 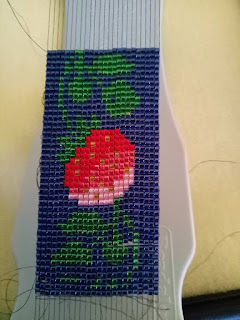 I now have Miyuki Delica 11/0 beads in colours that I have no project for - they're small, pretty and comparatively inexpensive. 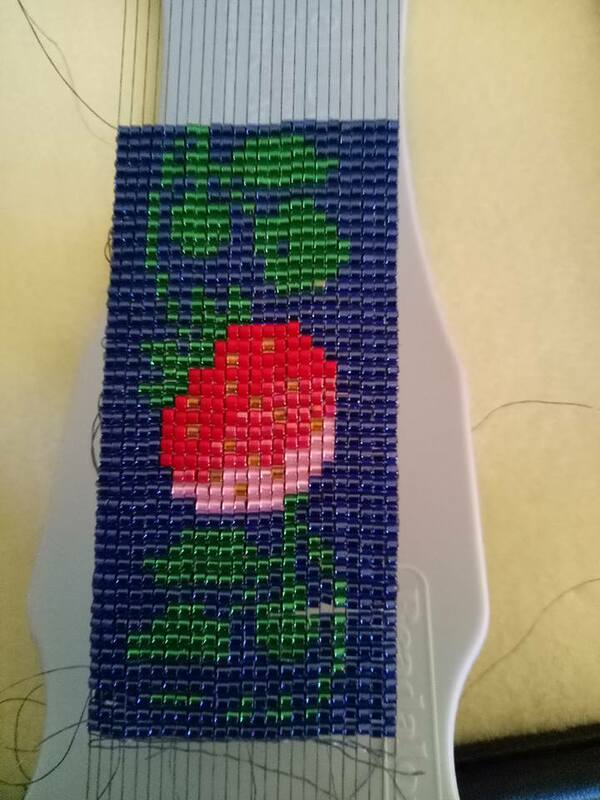 If you're interested the 11/0 beads are 1.8mm so I had to add a dozen extra rows to make it the planned length. I'd worked on 2mm graph to start with (though scaled up to 4mm graph paper cos my eyes hated the smaller graph). I finished the strawberry and thought, "whaaaa why is this shorter?" I worked out the maths when the penny dropped about calculating the number of rows based on 2mm when they're 1.8mm. Here are the two that I've already done the first stage for. 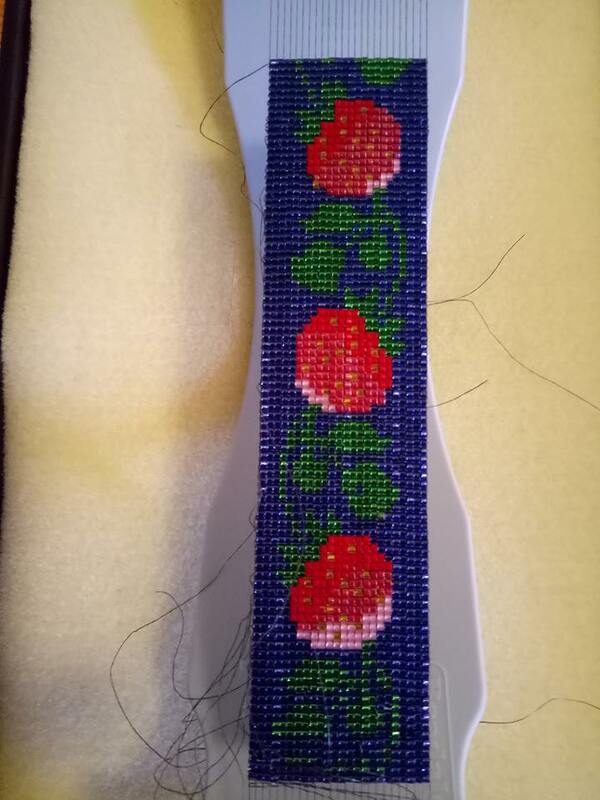 The first one - strawberry bracelet was a learning curve so had some stops & starts and reversing as I realised that I didn't like the colour combination. Getting the lighting right with my phone camera is a minor challenge, but I'll get a better one once it's turned into a cuff bracelet. My second project was a shadow of a mermaid, and I completely changed my bead selection. I'd thought that the Lagoon Mix would be great as a background and #2 Blue Iris as the mermaid however the mix included a dark blue that was very close to the Blue Iris, and the blue Iris wasn't opaque but translucent with green lustre that depending on light made it to similar to the lagoon darker green. So I put both those beads aside and used #83 Silver Lined Aqua as the background with #1 Gunmetal as the shadow. The chart was found by a google search although I didn't like the background, however while obsessively looking for mermaid cross stitch patterns as inspiration I found one which had heart shaped bubbles in the back ground. I used #629 Silver lined dyed Lavender as the bubbles as I'd tried white or pearl and that disappeared. The Lavender is subtle but not invisible. Her eye is #608silver lined blue - again not a high contrast choice. 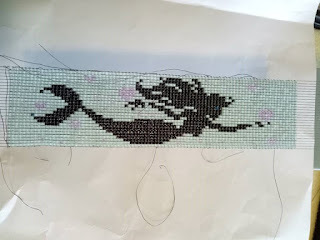 Finishing this part of the bracelet is making me want to finish my mermaid dress. That's now a higher priority. I need to learn the next steps, how to turn the loomed piece into a bracelet and then I'll be wearing them. I also worked out a different design for a mermaid bracelet (with Orca! ), inspired by a mix of cross stitch patterns, and I'm planning to use the lagoon mix so it's not going to sit in my stash for ages. The weedy and leafy seadragons have fascinated me since I first heard about them, and they are in Sydney harbour. 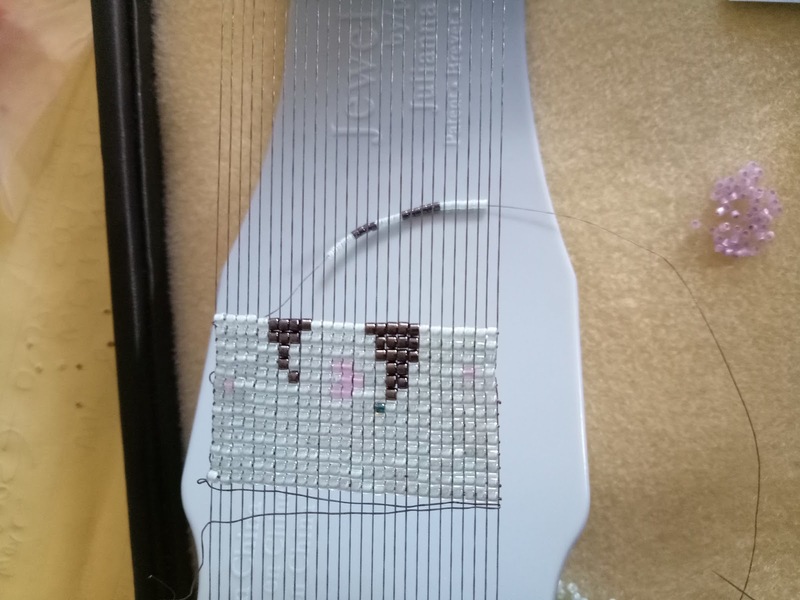 So I commissioned a couple of patterns and am about to start my 3rd bracelet. 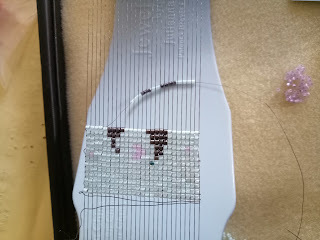 It's wider by half as much again and has 23 different colours so I'll need to focus and carefully mark off my rows. 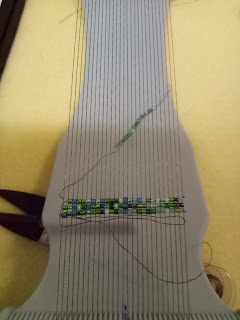 After that I'll make a Van Gogh Starry Night bracelet - yes I have the pattern and 3 of the 11 beads already. The original strawberry seeds, a jet black and the Blue Iris. I'm also going to do the second mermaid, and work on graphing up a Q*bert design. I loved that game and as it's an old school arcade the images I found are pixellated not modern more realistic images.